O' Holy Night! Cause of our Joy! One fine spring day, a few years ago, I was running an errand for my daughter. She had asked me to pick up some plants from a local nursery/statuary yard that the owner, had offered to give her for her window boxes. I have had a Mary Garden for years and love to browse statuary whenever I see some, but on that particular day, I was totally engrossed in just hurrying over there, retrieving the pro-offered plants and getting back home to my own spring planting. At the time my small patio garden had all the statuary I thought it needed. I certainly had no plans to explore the nurseries large selection. Well, as they say, the best laid plans are easily undone and for me especially when Our Lady is involved. As I pulled up in the parking lot, my eye spotted the biggest and most gorgeous,” Our Lady of Guadalupe “statue I had ever seen. Naturally, I made a quick detour into the statuary yard to look at it. Inspecting it up close, it quickly became an “I must have it urge.” The strange thing was that it had no price or sign on it like all the others in the yard. But I quickly became convinced by perusing the prices of other statues in the yard that this was a high end statuary business, and my tiny budget would never stretch to buy it even if I could think of a place to put it. Sighing with longing, I pressed a kiss to the hands of the Statue and chuckled a quick response saying; “Well, my beautiful Lady, I hope you find a very beautiful Garden and someone to love you as much as I do. With that, I went on into the nursery office to retrieve the plants my daughter had sent me for. The only employee around turned out to be the woman I was suppose to see for the plants. While she went to retrieve them for me, I browsed the little nic nac’s they had inside the office, just killing time. As soon as she returned from the back office, my plan was to thank her and hurry on my way. Well worth it, I responded. I told her that I was sure someone will really love to have that one as it is extra special, especially in these times of so much confusion concerning the alarming abortion rate this country is in. So many women who feel overwhelmed and confused when facing an unplanned pregnancy don’t realize that the life of an unborn child is very precious to God. God loves those poor mothers so much, and Our Lady of Guadalupe is a wonderful devotion which symbolizes Gods love and mercy for woman and children, especially those who make the mistake of aborting their children, thinking it will solve the problems they face. In the blink of an eye, the woman’s face dropped and tears began to flow. She sobbed so hard that I put my arms around her. She then began to tell me her story. She shook as she explained that she had aborted her baby boy, just a few months earlier and felt so guilty and ashamed of her decision. She asked me over and over, if I thought God would ever forgive her. Cradling her in my arms, I assured her that indeed, God could and does forgive her. I told her the story of Juan Diego and Our Lady of Guadalupe and how Mary’s message was still relevant today. God knew from all eternity, abortion would destroy many lives, but that those little lives are not really lost. The babies are safe in His arms, and the Mothers are precious to Him too. Mistakes are made by all of us, especially in difficult situations. God does not hate the sinner. They are His children. He hates the sin because of the damage it does to His creation. As she calmed down and listened, I gently took her hand and said; “Have you named your little boy?” She replied, yes, I think of him as Matthew. Then I told her about Project Rachael and promised to get her all the information on it. After giving her the information and a few words of encouragement, I turned to leave promising to remember her in my prayers. And as I was leaving she said; “You know, that statue didn’t cost us anything because the supplier sent it by mistake and didn’t want to pay the return shipping charges. Would you like to have it? 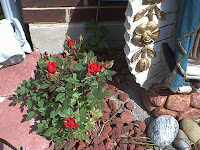 All these years later, that statue is my favorite one in my Mary Garden. Over the years, it has been a source of conversation for visitors and even workmen working on my house. Sure enough, Our Lady keeps mending souls. The men and the woman who have ventured through my garden, are drawn to her, and in conversation, many of them have told of the pain they have suffered from having had abortions or their wife or girlfriend aborting their child. And they all seem to name their aborted children Matthew or Mary. Our Lady never stops pleading for her children. Just as a Postscript: Our Lady comforts me also. 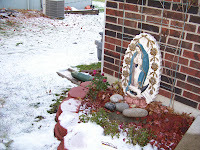 The above picture of my statue was taken last winter, December 13th, which is the anniversary of my beloved husbands death. Roses blooming in ice and snow, are no problem for her either. Our Lady of Guadalupe continues to call us all to conversion and healing. Today, may we all go to Our Mother, for comfort and grace in all the situations we find difficult. Our Mother will always listen and give us the grace we need, no matter how difficult the situation may seem. Happy Feast day Mama Mary! As a member of the Catholic Writers Guild, I have been blessed to meet and become friends with many wonderful Catholic writers. If you thought religion is boring to read about...Think again. First review for your reading pleasure is by my friend Karina and her husband Rob, Infinite Space, Infinite God is a thrilling science Fiction read and fully Catholic too. If you like SF this is a winner and a must read. Is that religion in my science fiction or science fiction in my religion? The writers of the Catholic SF anthology Infinite Space, Infinite God have seamlessly combined the two. The fifteen stories of the Catholic Church meeting challenges from genetic engineering to time travel both entertain and make you think. * Meet genetically engineered chimeras and aliens who wonder what a human religion holds for them. * Share the doubts, trials and triumphs of humans who find their journeys in time and space are also journeys in faith. * Marvel at technological miracles--and miracles that transcend technology. * Meet the writers who made a leap of faith and dared to incorporate familiar religion with fantastic universes. This months new book is from Guideposts Miracles Happen Series, Titled Miracles of Nature. I have three stories in this book of the series. Amazing Grace of Butterflies: Is a story about my Dads love for Butterflies and how he taught us to love God through nature. In the Eye of the Storm: Is about the Tornado we lived through by Gods Grace and Miracles in 2003. Toni and the Cowboy: Is a story about doing good for a stranger caught in a blizzard and how he returned the favor in a most amazing way. These are my favorite ones and I highly recommend their books and magazines. Of course I am a bit prejudiced as they publish my stories, but keep in mind, they also publish other outstanding writers works too. I always look forward to reading the stories others write and I am never disappointed with the great stories these publishers choose. You can order direct from them, or most Christian Book stores, Amazon.com, and Barnes and Noble carry them or can order them for you. Canticle Magazine, the “voice” of Women of Grace®. Dedicated to helping all Catholic women to live out their vocation more joyfully and faithfully – wives and mothers, single women, and religious from all ethnic and cultural backgrounds.Canticle Magazine is a bimonthly magazine who's Editor Heidi Saxton, does a terrific job. It is part of "Living His Life Abundantly - EWTN "
Amazing Grace Series is an anthology of Inspiring Stories from Ascension Press. Matt Pinto, Jeff Cavin and Patty Armstrong are the Editors and publishers of this fine series of Books. 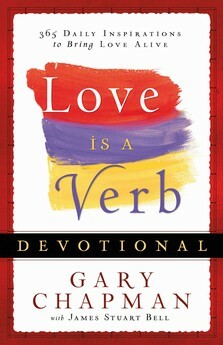 Each one contains short stories of everyday people who God has touched with His miracles of Love. "When Miracles Happen " Hardcover Books, are a Series of Anthologies from Guidepost Books. Always good,, clean faith filled stories you can count on to uplift your spirits and enrich your faith. God Allows U-Turns, is another anthology series of books by Allison Bottke . They publish books to encourage life-changing U-Turn choices through books for adults, children and youth . Last but not least, The Chicken Soup for the Soul books which everyone knows and loves. They always produce great up-lifting stories which inspire people of all faiths to reach higher and hope even when hope seems out of reach.